An official competition for programmers of making application for BlackBerry 10 platform, Jamhack 2012 for Asia region conducted in Bangkok, Thailand was won by Inspira team from Indonesia. The team which is leaded by Vincentius Putra won by making an application named Soccer Ticker. The prize $100.000 and a trip ticket to attend BlackBerry 10 global launching in New York. "Basically Soccer Ticker is an application where you can always see updated schedule of favourite football match, minute by minute telling the situation on the pitch. Aside, the users can chat with other users," said Putra. 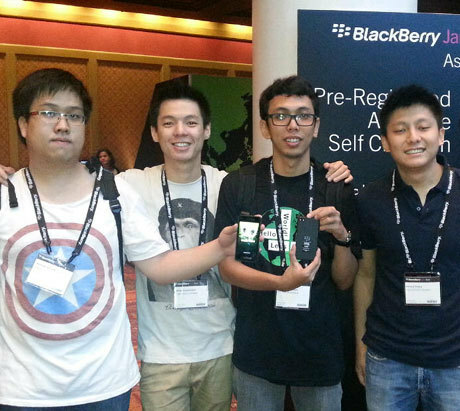 Previously, the Inspira team has won the local BlackBerry application programmers tournament in Jakarta which was followed by 20 contestants. Then they sent to Bangkok, they won the Asian tournament after managed to beat many contestants from other Asian countries. Soccer Ticker will be available in application shop BlackBerry World, later before the launch of BlackBerry 10 and will be promoted for 2 months. Soccer Ticker application defeated Hive by Australian team and Lifebox 360 from Vietnam. "This application is an unique because I have not seen like this. Livescore as the example, there is no social feature for chatting." said Putra. The social feature that Soccer Ticker offers are chatting with other users and commenting the football match in real-time. There will be also football full match schedule, standing result, and others that related to football with its detail. No response yet to "Indonesian Programmer, Inspira won BlackBerry Asian Application Developers Tournament, Jamhack 2012"
• Do not post material that is hateful or mean towards race, religion, gender, etc. • No discussions of software piracy, or illegal material. Sign up here to receive updates through your email. We send you mail at most ONCE a day.